As you may know, I'm not American. The spouse and Mr Chubby-Cheeks were born in the US, whereas I was born in Canada. But that's not the whole story: my parents are Iranian who fled the Islamic revolution in 1979 due to their religion, I was born in Canada, raised in Venezuela (which is why I've written about dengue), and I actually met the spouse while working for a year in Israel. I don't know where we'll end up: probably wherever I get decent job offers. Until today, my blog has been very US-centric, but this post will have a more international angle. "Most developed nations do not consider GMOs to be safe. In more than 60 countries around the world, including Australia, Japan, and all of the countries in the European Union, there are significant restrictions or outright bans on the production and sale of GMOs." You can see how this can lead to a conspiracy theory with the following narrative: GMOs aren't properly tested in the United States. In Europe, scientists have discovered that GMOs can be harmful and they've been banned. But in the US, the FDA is in bed with Monsanto, which is why we're eating these toxic poisons and we aren't being told the truth. To quote Professor Higgins, it's "so deliciously low, so horribly dirty!" Hence the appeal of this particular conspiracy theory. In terms of "bans", there's actually only one country in the world that has an outright ban: Kenya. Recently, there have been calls to lift the ban due to farming losses. All other countries have laws and regulations surrounding biotech crops. That includes the United States. There's a reason why you can't just make a transgenic crop and have it sold in stores the following season. So, for the rest of this article, I'm going to look at laws surrounding GMOs in 4 different countries: Canada, Israel, Venezuela and Iran. It's the "The Life and Times of BioChica as told Through GMO Legislation Around the World". However, Venezuela relies very heavily on imports and food shortages have become increasingly common the last decade and have hit an all-time high in the last 1-2 years. Two of Venezuela's biggest import partners are Argentina and Brazil, who also happen to be global leaders in the number of acres dedicated to transgenic crops. Despite the fact that Venezuela needs a dramatic increase in food production to meet the demands of its growing population, it plans to pass a law that will straight-out ban growing GMOs. I can only conclude that Venezuela's position has NOTHING to do with the safety of transgenics. If it was legitimately about safety, then there would be laws surrounding their import. In reading articles and news stories, the sense that I get is that Venezuela's ban on transgenics seems to be due to 1) sticking it to "imperialist" big-Ag. 2) striving for food sovereignty and 3) removing GM seeds from the equation so that small farmers can be successful in the socialist revolution. However, there's no evidence that the moratorium on growing GMOs has contributed to any of these goals given the devastating food shortages. Iran: Unfortunately, I can only read Farsi up to a 1st or 2nd grade level at best, so most of this information came through translated material. Only one transgenic crop has been approved for cultivation in Iran: rice. It makes perfect sense: rice is eaten every day in an Iranian household. According to my dad, it's not real food unless it has rice. A form of Bt-rice was approved in 2004, but when President Ahmadinejad took office in 2005, his administration "decided against the release of GM crops". It's important to note that Iran was the first nation to commercialize transgenic rice and this article outlines how Iran had hoped to quickly follow this success with additional crops. There was no ban or legislation against GMOs. Apparently, the decision to drop the commercialization of GMOs was due to the lack of a "biosafety law in the country, and 2) lack of harmonization among different stakeholders (Ministry of Agriculture, Environmental Protection Organization etc.)". However, the Iranian government now feels that a decent biosafety law is now established, and the law's text states that the government should facilitate the release, research, commercialization, etc of GMOs. Israel: Before I start this section, I've got to tell you something about Israel. It's a desert. It's hot. It can be really dusty. But despite all this, the local fruits and veggies are spectacular (here's Wikipedia's article on agriculture in Israel). There are no GMOs commercialized in Israel, even though the country is a hotbed for research into GMOs. This comes as no surprise considering the interest that the nation has in drought-resistant crops. Apparently, this is due to the fact that a very large portion of Israel's agricultural exports head to the EU, where they are slow to approve transgenic crops for import and have labelling laws as well. As such, growing GMOs might have financial repercussions if the EU were to decide to be more wary of Israeli produce. I couldn't find the actual text of any laws. If anyone out there knows where I could find them, please let me know. Canada: This database lists a slew of GMOs that have been approved for cultivation in Canada. Health Canada's website has a great description of the regulatory process to gain approval for cultivation and/or sale of a new crop. When someone is interested in submitting a new crop, they're encouraged to consult with Health Canada beforehand to determine if there are any potential red flags. Then they submit the paperwork and undergo a scientific assessment. Health Canada can request additional information, will summarize it's findings, prepares a ruling, and then posts the information on the Health Canada website. It seems very similar to the process in the US under the FDA. What struck me when I was doing research for this article, is how little the science of GMOs were mentioned. I didn't find any evidence to support the Non-GMO projects' statement that "most developed countries do not consider GMOs to be safe", albeit I only looked into 4 countries for this article. However, these 4 countries are extremely diverse in terms of economic status and development, as well as their relationship with the US. Despite these differences, I think that the common thread in this article seems to be the fact that laws for and against GMOs are economic or political in nature, and have little to do with safety. If it were genuinely about safety, then they'd ban the import of GMOs and join the ranks of Kenya. Happy New Year y'all! Or, Feliz Año! So, the spouse has often complained that I don't have a post with an overview of what transgenesis means and the transgenic (GMO) crops themselves. They're scattered throughout the history of this blog, but not in a single place. Transgenesis means taking a gene (or genes) from one species and sticking it into another. Unlike another process known as cisgenesis, transgenesis involves adding genes from a species that is sexually incompatible with the organism in question. Transgenesis is like taking a gene from a pomegranate and adding it to a Granny Smith apple. In contrast, cisgenesis is like taking a gene from a Red Delicious apple and adding it to a Granny Smith apple. For transgenesis, the species doesn't even have to be a plant: you can take a gene from an animal or bacteria and add it to a crop/plant or viceversa. What does this mean? To explain, I have to go to the beginning: the working units within any cell are proteins. Proteins are made up by linking together amino acids in a given sequence. The exact amino acid sequence is defined in the cell's DNA; the DNA blueprint for a specific protein is known as a gene for that protein. In general, one gene encodes for one protein (of course, there are exceptions). Since there are thousands of proteins, there are thousands of genes. We're still figuring out what different genes/proteins accomplish. Spouse: I think that you've been surprised by the fact that I can't just "make up" a protein. I wish!!! No, biotech still isn't at the point where I can say "I'm going to invent a DNA sequence that's a blueprint for a protein that will make the plants absorb more water". That would be AWESOME. The best we can do right now is to look in nature at the plants/animals/bacteria that have the trait that we want, find out what protein accomplishes that task, and then use it in transgenesis. The reason why this is important in discussions about transgenesis is that the proteins that have been added to GMOs are already in nature. In transgenic crops, they've taken one or more genes from different species and added them to the plant's DNA so that you have new genes/proteins in the plant. That brings us to the main point of this article: what are some of the more popular genes/proteins that have been added to commercial transgenic crops or GMOs. EPSP synthase. A wonderfully short abbreviation for the painfully long "5-enolpyruvylshikimate-3-phosphate (EPSP) synthase". EPSP synthase is a protein that naturally exists in bacteria, plants, and fungi. The protein is part of a system that makes several crucial amino acids in these organisms. The active ingredient in weed killers such as Round-Up is "glyphosate", a synthetic compound that blocks EPSP synthase. The plant can't make the amino acids that it needs to survive so it dies. In order to make plants resistant to glyphosate, the EPSP synthase enzyme from a bacteria was added to the plants. This bacterial enzyme does the same thing (ie. it synthesizes the amino acids) but it's just different enough that glyphosate doesn't block it. It's important to note that EPSP synthase doesn't exist in mammals, which is why glyphosate has low toxicity. My previous post on glyphosate is here. In the US, the transgenic crops cultivated with the EPSP synthase gene are: alfalfa, canola, cotton, corn, soy, and sugar beet. AAD Enzyme. Another mercifully short abbreviation for "aryloxyalkanoate dioxygenase enzyme" and is from the bacterial species Sphingobium herbicidovorans. The protein breaks down 2,4-dichlorophenoxyacetic acid (2,4-D), a pesticide that's been used for many decades because it kills broadleaf weeds. 2,4-D mimics a natural plant hormone in these weeds, causing their leaves to grow uncontrollably, wither, and the plant eventually dies. The AAD-1 protein allows the plant to break down 2,4-D, so nothing happens to it (for a diagram of the biochemical reaction, please see here). In the US, there's only one transgenic crop with the AAD-1 gene approved for cultivation: corn made by Dow Agro was just granted approval this year. However, there are several others in the works. Bt trait/Cry protein. There are several proteins from the bacteria Bacillus thuringiensis (Bt) that have been used in various crops and they're known as Cry proteins. Apparently, there are over 200 different Cry proteins from the Bt bacteria and they're toxic to specific orders of insects and nematodes. The insects that Cry proteins target are not all the same, which is why different proteins are used. Additionally, since the protein is toxic to insects, you may also see it referred to as "Bt-toxin". This website from UCSD offers a really simple explanation on how the Bt-toxin works: the protein dissolves in the high pH environment in the insect's gut. Then, it binds to receptors in the bug's gut causing the wall in gut to dissolve, which eventually kills the insect. Cry proteins are also used in organic farming (if you weren't aware that organic food production uses pesticides, please see bullet #2 here). The pesticide is considered to be benign to humans because the protein's mechanism of action doesn't work on mammals: our guts have a low pH and we don't have the receptors that the Cry protein binds to. Bt-corn and Bt-cotton have been commercialized. There's exciting work being done with Bt-eggplant in Bangladesh. We had a papaya tree in our backyard in Venezuela. I love the stuff, but the spouse can't even stand the smell. Proteins from plant virus coats. In the United States, there are two commercial crops that have disease resistant traits: summer squash and papaya. Hawaii's Rainbow papaya is one of the great success stories of transgenesis: the papaya ringspot virus was threatening to wipe out this crop, which is a $17 million industry for Hawaiian farmers. In 1997, farmers started planting Rainbow papayas which have a protein from the virus itself. Likewise, transgenic summer squash carries proteins from several viruses which can harm this crop. I previously read up and shared my learning about how these proteins confer disease resistance to transgenic crops. Briefly, the transgene encodes for a protein from the virus (coat-protein) and this "blocks" the infection process from starting (interferes with the virus' disassembly). This is known as "coat-protein mediated resistance" or CP-MR.
As you can see, there are no blue-strawberries or fish-tomatoes in the list. Such crops have never even made it far enough to start the regulatory approval process. I had written a conclusion for this article, with something along the lines of "See?? There's nothing scary about transgenesis! All you're doing is taking a protein that we know a lot about and moving it into a plant." But then I realized that to a lot of people, that can be scary, so I think I need to explain just a tad further. You may have read arguments from GMO advocates stating that "we've been genetically modifying food for thousands of years. There's nothing different here." To a large extent, that's true. When you cross breed two compatible species, it's generally because there are specific qualities from species A and species B that you want to blend into a single species. For example, you may want to cross a rice strain that is naturally insect resistant with a second strain that grows very quickly. When you perform such a cross, you're blending all the genes from the two rice strains and then trying to find the hybrid that has all the traits that you're looking for. Now, imagine instead that you know EXACTLY what gene/protein(s) caused the insect resistance in the first rice strain. Instead of crossing the two strains and blending together thousands of proteins, you specifically add this one protein to the second strain. How would you feel about that? My guess is that the vast majority of individuals would be OK with it. Now how would you feel if that gene/protein came from barley and you're adding it to rice? Again, I think many would be fine with it. But what if it came from a bacteria? I think that THIS is where the fear creeps in: the addition of a gene from a species that "doesn't belong". To be clear, I have no evidence to suggest this and have never polled anyone on this topic: it's just from conversations that I've had. And I think the reason why the majority of scientists don't have this fear is because we see things as proteins, and genes, and units, and no gene "belongs" to a species. We see genes/proteins as building blocks that came into existence in viruses and bacteria, and have changed, morphed, been copied, and erased throughout evolution. I work with enzymes (proteins) that have been mutated and morphed by companies so that they do what scientists need them to do in the lab. Back in grad-school, we added and removed genes in mice to figure out what they did in human disease. It was so common, that it had it's own term: "making a mouse". So the concept of adding a gene that we know a lot about into another species doesn't scare me nearly as much as it freaks out the spouse. In reviewing this piece, he agreed with my assessment adding that he views a species as a whole, whereas I view a species as bits and pieces that make a whole. Several months ago, there was a thread on the GMO Skeptiforum on Facebook about natural pesticides. It's one of the threads I learned from the most, so I thought I'd share some of it here along with the papers to back it up. So, what are "natural pesticides"? Plants and animals have evolved mechanisms to fight against their predators. Some of them are mechanical, like thorns or spines on a puffer fish, but some are chemicals or natural pesticides. It's important not to let the term "pesticide" confuse you. When the spouse read this article, he said that he didn't get why I used the term "pesticide" to describe a component/chemical in a plant. We're used to thinking of pesticides as the stuff we spray on plants or around our house to get rid of bugs. But the term "pesticide" is much broader than that: it's any substance that gets rid of or repels a pest. The term encompasses many different -cides: herbicides (to get rid of plants), fungicide (to get rid of fungi), insecticides (to get rid of insects), etc, etc. A natural pesticide can be toxic to the pest that its evolved to target, so I use the term "toxin" in this piece as well. These pesticides or toxins can be very specific in the organisms that they target: for example, the Bt-toxin which is found in different GMOs is actually from a bacteria in the soil and it is toxic to various insects, but the way it works doesn't impact mammals; chocolate is toxic to dogs, but not to humans; etc. I first became aware of natural pesticides in my teens when my mom told me that I shouldn't buy green potatoes because they can make you sick. Back when we lived in Venezuela, every Friday morning my mom would go to the market to buy our fresh produce for the week. In my last two years of high school, I was lucky enough to not have morning classes on my schedule, which turned out to be unlucky for me because I'd get dragged out to the market. Unlike the fru-fru-shee-shee farmer's markets we've got in California, the market in Barquisimeto, Venezuela was dirty and really crowded. I always got stuck buying the potatoes, tomatoes, and passion fruit, while my mom bought the greens, papayas and melons. The potatoes were caked with dirt, so I'd have to smack them to see if they were green or not. Most of the time they were. As I got older, I wondered if my mom's advice was a mythical Persian legend or if it was legit, and Wikipedia helped me find the answer. Potatoes are a member of the nightshade family which have a poison called solanine present in different parts of the plant. This paper from Lancet published in 1979 states that potatoes have small amounts of solanine in the peel and none in the flesh, but when the potato starts to green or sprout (i.e. the 'eyes' start growing), then the amount increases significantly. Solanine levels also increase in potatoes when they're diseased, such as with the blight, and is probably part of the plant's defense system. The Lancet paper documents several cases of solanine poisoning from eating potatoes, but they were not typical cases (for example, individuals may have been malnurished). Current guidelines from the NIH state that eating solanine in very small amounts can be toxic and recommends throwing out spoiled potatoes or those that are green below the skin. Caffeine: This paper from 1984 suggests that caffeine inhibits insects from eating the plant. It "appears to suppress certain enzymes in insect nervous systems". Attempts have been made at making a caffeine-based pesticides with mixed results. The chemical compound also magically makes my husband a much more agreeable person in the morning. Nicotine: Also present in the nightshade family of plants, nicotine is one of the very first agricultural pesticides developed, particularly since it is "toxic to most herbivores". It was phased out of farming in the US as of 2014. Capsaicin: It's what makes peppers hot. Does it really surprise you that it's a natural pesticide? What animal in its right mind would want to punish themselves by eating terribly spicy foods? Apparently Homo sapiens... The first pesticide containing capsaicin was registered with the EPA in 1962. As you know, it's an irritant to most mammals, but it can also repel or kill insects. 2,4-dihydroxy-7-methoxy-1,4-benzoxazin-3-one (abbreviated as DIMBOA): a pesticide found in corn, wheat, rye, other grasses. It is released in these plants when a tissue is damaged and it's toxic to a wide range of insects and bacteria. Tetradecanoic acid in nutmeg: has been tested as a potential larvicide against the yellow fever mosquito. Pulegone in peppermint and catnip: found to be a potent insecticide. Carvacrol in oregano and thyme: has antibacterial properties by making the cell membrane of bacteria permeable, including E. coli. Eugenol in cloves, nutmeg, basil and others: used as a bait in many pesticides, data suggests that it can also cause liver damage. The list is virtually endless. In 1990, Bruce Ames published a paper entitled "Dietary pesticides (99.99% all natural)". In it, he and his coauthors outline that we eat an estimated 1.5 grams of natural pesticides a day, "which is about 10,000 times more" than the amount of synthetic pesticide residues we eat. This amount would be significantly higher in vegetarians and vegans. As an example, the authors provide a list of 49 different pesticides found in cabbage alone. The concentrations of these pesticides are in parts per thousand or parts per million, whereas the amount of synthetic pesticides we find on our food are in the parts per billion range. Despite the vast amount of toxins in our diet, only a handful of these have ever been tested (note that the paper was written in 1990, but the point still stands). The paper highlights that of all the chemicals tested for chronic cancer tests in animals, only 5% have been natural pesticides and half of these were carcinogenic. Think about that for a moment. While there's an uproar about parts per billion amounts of synthetic pesticide, there are more concentrated compounds in fruits and veggies known to cause cancer (at much higher doses). In addition, some pesticides used in agriculture have mechanisms of action that are specific to the pests their targeting. I've already given the example of Bt-toxin, but glyphosate shuts down a biochemical pathway in plants that simply doesn't exist in mammals. 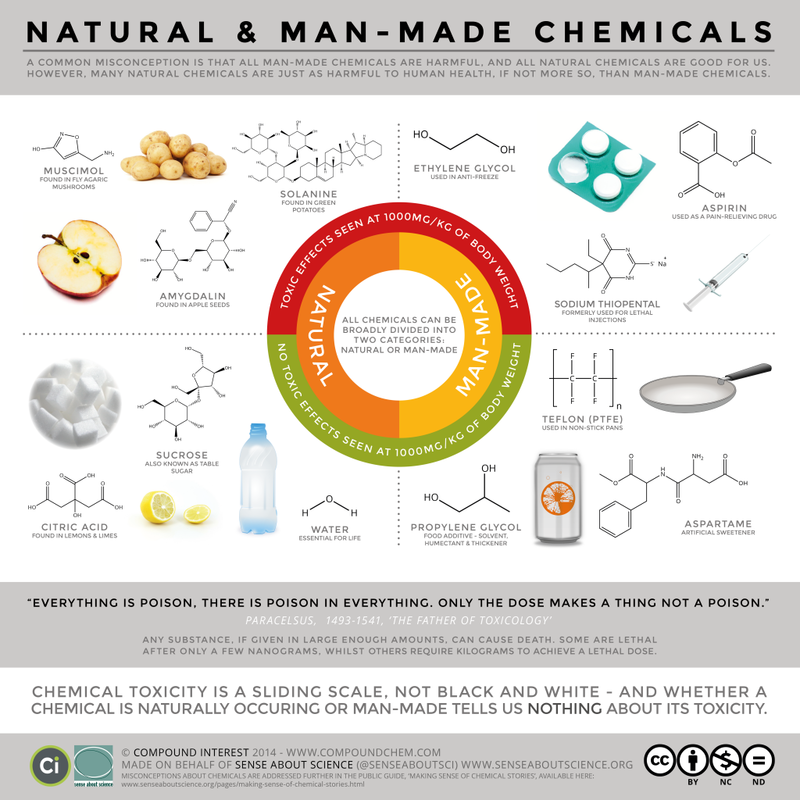 For some reason, we're far more concerned about these two compounds than we are about natural formaldehyde in pears. Check out the FANTASTIC graphic at the end of this article that highlights this point: we fear anything that's synthetic because we assume that it's "bad for us", but there's plenty of stuff that's "natural" that can be harmful at the appropriate dose (I wanted to entitle this article "The Hidden Carcinogens in Your Food", but it seemed too click-bait-y). I've read a lot of arguments from anti-GMO groups about how transgenic crops that have the Bt-toxin will kill us all, because it's a registered pesticide with the EPA. "Do you want to eat something that's a pesticide???" is what I've read time and time again. There are plenty of "natural chemicals" that are registered pesticides, as I've noted above, but no one seems to be freaking out about basil and mustard seeds. Additionally, what many GMO-advocates will point out is that the cross-breeding and "natural" hybridizations we've been doing for centuries has undoubtedly impacted the levels of some of these pesticides by unknown amounts, because no one examines them. Going back to solanine, in the '60s a new strain of potato known as the "Lenape" potato was developed through "natural" methods, but was found to be toxic due to increased levels of solanine: it had ~2-4x the amount of solanine found in other potato varieties and it had to be pulled off the shelves. But no one seems to be screaming about "unintended consequences" of traditional crossbreeding. Well, 'tis my bed time. I hope all had a great thanksgiving. You can probably thank natural pesticides for half the flavors in the delicious food you ate!! Jeopardy Category: "Things that are often blamed on GMOs, but are much broader in scope"
Before I forget, I just added a subscription to the blog, in case you want to get an email notification when a post gets published. So here we go: BioChica's List of "Agricultural Issues that are Often Blamed on GMOs". It would be awesome if I could have presented this with a Family Feud animation... Let's do it Jeopardy-style!! 1) Q: This issue is often attributed to GMOs, when critics state that farmers shouldn't be forced to buy seeds. A: What are patented seeds/crops? As discussed previously, many plants are patented, including decorative plants. Plants generated through traditional methods, including mutagenesis, take years of research to produce and breed, and patents are the only way to safeguard those investments. The author of this Huffington Post article interviewed several farmers and asked them about their seed choice, and the overall conclusion is that farmers can select what they'd like and actually have a lot of options before them, many of which are from companies such as Dow, Monsanto, and Syngenta. If farmers are choosing to grow patented crops, perhaps it's because they like the products (see this excellent post from The Farmer's Life on this topic. This article from GLP, written by a farmer from Iowa, walks readers through the decision process of selecting a seed). 2) Q: This issue is often attributed to GMOs, when critics state that GMOs should be labeled so that consumers can avoid harmful toxins. A: What is the use of pesticides? Glyphosate-resistant crops (the active ingredient in Round-Up) are among the more popular genetically modified plants. However, even glyphosate use isn't limited to GMOs; it "is utilized in a wide range of applications including weed control in vineyards, olive groves, fruit orchards, grass pastures, forestry, parks, gardens and underwater usage in rivers and lakes". As mentioned in previous posts, organic farming practices do not exclude the use of pesticides, so if consumers are advocating for GMO labeling so that they can avoid pesticides, they've been misled. In fact, none of the so-called "dirty-dozen" fruits/veggies are GMOs (keep in mind that the FDA recommends washing your fruits and veggies under running water as an effective means of removing residual pesticides. In Venezuela, we used to wash and soak our raw vegetables for salad in a vinegar solution, but I think we started that practice during a cholera epidemic...). 3) Q: This practice is often attributed to GMOs, when critics state that growing vast areas of crops without any rotation leading to issues including the depletion of nutrients from the soil and crop-specific pests. A: What are monocultures? Wikipedia defines monoculture as the "practice of producing or growing a single crop or plant species over a wide area and for a large number of consecutive years". A legitimate issue is the spread of diseases, which is actually what led to the Great Famine due to the potato blight. The idea is that by rotating crops (i.e., planting different things every year), crop-specific pests will die out. But the issue is very far from being a GMO-specific problem. Our house in Venezuela faced a huge valley where sugar cane was grown and was owned by the local sugar-cane refinery. They had 3-4 sugar cane harvests each year and would burn the fields between harvests. Huge strands of ash would fall from the sky and we used to call it "lluvia negra" or "black rain". Field burning is not only used to make sugar cane harvesting easier, but it is also used for pest control. In the +20 years my family lived there, sugar cane was the only crop ever grown, so that giant swath of land was the embodiment of a monoculture. I've thought about this specific example quite a bit, and I'm not sure what the appropriate solution would be. Why would a sugar refinery grow anything other than sugar cane in South America, so how would they rotate their crops? Leasing the land? Many consider monocultures to be a symptom of corporate farming where are food is owned by large, multinational corporations, but in fact, 96% of farms in the US are family farms. Definitely a complex issue, but reducing it a GMO-specific problem doesn't capture the extent of this global issue. 4) Q: These organisms are touted as examples of how GMO-pesticides are failing. A: What are pesticide-resistant insects? An equally valid answer is: What are superweeds? Superweeds and pesticide resistant insects are examples of evolution in action, and as discussed in question 3, are often a result of monocultures. If you're an avid fan of X-men, you'll know that the very first line in the movie is "Mutation: it is the key to our evolution. It is how we have evolved from a single-celled organism into the dominant species on the planet. This process is slow, and normally taking thousands and thousands of years. But every few hundred millennia, evolution leaps forward." Such a great movie... But I digress! Given the fact that the life cycle of a bug or a weed is much shorter, particularly when we consider them pests and try to squash them, we don't have to wait thousands of years to see them evolve. If a plant or an insect gains a mutation that gives them a selective advantage (in this case, the ability to survive in the presence of a pesticide), then it will survive and spread. We see the same thing happening with antibiotic resistant bacteria, and of course, viruses. Every year, the formulation for the flu vaccine changes because the little suckers evolve to try to beat us. With HIV, patients use drug cocktails, because the odds of the virus becoming resistant to a variety of different drugs is much, much lower than the odds that it will gain resistance against a single drug. Again, both issues are not specific to GMOs. This article gives plenty of examples of superweeds that evolved from the use of pesticides in non-GM crops and points out that the issue is not specific to GMOs, yet it's a convenient narrative for GMO opponents to exploit. There's a whole database dedicated to tracking pesticide resistant weeds. Even handweeding can cause superweeds. This article suggests that handweeding in rice fields in Asia has led to a superweed that closely resembles rice, a phenomenon known as "crop mimicry". A strategy for beating superweeds is to create crops that are resistant to 2 pesticides (BTW, pesticides is the umbrella term for insecticides, herbicides, fungicides, etc. They all eliminate pests). The idea is that the odds that a plant will naturally evolve to become resistant to 2 herbicides is pretty low (same basic strategy as the HIV drug cocktail). Dow Agro has the Enlist Duo product line, which allows for the use of two pesticides (glyphosate and 2,4-D choline). They're currently waiting for the combination-pesticide to get approved by the EPA. However, there are others that argue that this will also be a short-lived strategy (see last section of this great article from NYT - thanks to @wyoweeds for pointing it out). When it comes to pesticide resistant insects, farmers generally have insect refuges if they're growing insect-resistant crops (such as Bt-crops, which are resistant to worms). This requirement is outlined in their Stewardship agreement (explained here). Basically, a small area next to the field with the GM crop is supposed to be planted with non-GM seeds. The idea is that if an insect develops resistance to the pesticide, then it will mate with a "normal" bug because they'll be found in abundance in close proximity. Their babies will be "normal" babies, not mutants, so they'll eventually die because of the pesticide and the mutation won't spread too broadly. Here's a diagram outlining how the refuge works (it might bring you flashbacks of Mendel's peas :) ). The worms in blue are the mutants that are pesticide resistant. The red ones are "normal". The example on the left is a farm where there's an insect refuge. The one on the right doesn't have a refuge. However, Bt-resistant bugs have emerged, partially because some farmers do not grow insect refuges. The onus is on the farmer to abide by their contract, but I do think that biotech companies could do a better job enforcing this. If they have the resources to police seed saving, then they could enforce the refuge requirement as well, particularly since it has a bigger impact on their bottom line in the long term. But even with refuges, it's a numbers game: it's only a matter of time before a pesticide-resistant insect emerges. All of these questions are legitimate issues and I hope to investigate each one. I imagine that they require coordinated efforts to address, including farmers, scientists, and biotech companies at the table. Reducing it to a GMO-specific issue is not only disingenuous and misleading, but it also deters efforts of finding real solutions. It's been over a year now since I started learning about GMOs and writing this blog. I've learned so much and am humbled every day by how much I have yet to learn. But as I look back and reflect on the knowledge gained, I also see that it's quite a bit, particularly considering all the life-events that have taken place in parallel. I thought that I'd share with you my learnings about GMOs that have surprised me the most. Some of these were on the level of an M. Night Shyamalan movie-twist for me. Some are not even about GMOs, but just about agriculture and our food in general. Yeah... I kinda feel embarrassed about not knowing a few on the list... Don't judge me! 1) The vast majority of fruits and vegetables are not transgenics. Before starting this blog, I thought that most of what we ate were transgenic crops, meaning that they had a gene/protein from a different species. I had heard so much about tomatoes with fish genes and strawberries that would never freeze that I just assumed that all that stuff was out on the market. Every time I picked up a fruit in the supermarket that was particularly large, I thought to myself "huh... that's got to be a GMO". You know those grapes that are the size of a tennis ball, and squirt juice everywhere when you bite into them? Every time I ate one, I'd close my eyes and thank the mysterious GMO gods for that sweet delicious nectar. Little did I know that none of these fruits were GMOs. They were genetically modified in the sense that they had been bred and selected to have optimal sweetness and size through cross-breeding. But they weren't transgenic organisms. There are only a handful of transgenic crops such as corn, soy, or cotton. The short list can be found in this database (note that you have to select the type of approval to determine if the GMO has been commercialized or not). 2) Organic food production uses pesticides (EDIT: Not all organic food production and only pesticides that are permitted under the USDA's organic label and approved by the EPA. Which is also true about conventional farming). This one blew my mind. I couldn't believe it! I thought that by definition, organic food production did not use pesticides. Not only that, but some of the pesticides used are more toxic than those applied in conventional farming. The difference is that the pesticides used in organic farming are not synthetic. No idea why that is better... Here's a list of pesticides approved for use in organic farming. 3) Many plant traits are developed using mutagenesis. And can be labeled "Organic". This one melted my brain and the spouse still doesn't get it altogether. Mutagenesis is the use of radioactivity or mutating chemicals to create random mutations in plants, and selecting those with the desired trait (here's my blog post with an overview of various papers, and here's the Wikipedia article on the technique). This article from the New York Times lists wheat, barley and even ruby red grapefruits as crops generated through mutagenesis. Imagine that!! The delicious, organic, grapefruit from my farmers' market was developed using radiation to randomly create mutations, and somehow that's less scary than a GMO. Why the organic food movement isn't fighting for their labeling seems hypocritical, and the fact that they can exist under the umbrella of the organic label is astounding. Again: Mind. Blown. 4) There's lot of peer reviewed research on GMOs, both publically and privately funded. I mean a LOT. I remember the first time I typed in MON810 into PubMed (a database hosted by the NIH), I got over 100 hits. That's 100+ studies that have looked into some aspect, such as identification or safety, on a single seed/trait (MON810 is Monsanto's Bt corn) Since it's a database search, let's assume that some of them are only loosely related to MON810. But even if 50% are discarded, that still leaves us with 50+ studies on a single trait/seed. In a Q&A with the founders of Biofortified.org, they mentioned that the most common misconception about GMOs is that there aren't any studies. Although I didn't think that there were no studies whatsoever, I was blown away by the sheer number/volume of studies, many of which are publicly funded. 5) Types of traits used to generate GMOs generally benefit farmers, not shoppers. What I mean is that there aren't many GM crops where the trait introduced was selected because it would make me want to buy it in the grocery store. There are several crops in the pipeline designed for me, such as non-browning apples or soy that has healthy oils (my post about the non-browning apple is here). But at the moment, most crops are designed to benefit farmers, such as Bt crops which help farmers reduce the amount of pesticides sprayed to fight worms, or Glyphosate resistant crops, which help farmers fight weeds using glyphosate (my post about glyphosate is here). I have yet to write on the topic of whether GM crops lead to decreased pesticide use, so I have a lot to learn on this topic. It's important not to misinterpret this point: when costs decrease for farmers, the end consumer pays less. But this is an indirect benefit for the shopper. It'll be interesting to see if crops that directly benefit shoppers will impact their perspectives on GMOs. 6) The amount of misinformation surrounding this topic is staggering. And depressing. It ranges from the subtle, where statements are simply taken out of context or the complete findings of a paper are not provided, to outright lies. I expected that there would be misinformation, but I guess I was pretty naïve and didn't think it would be THAT bad. But it's downright awful. For example, the Institute for Responsible Technology's website states "The only published human feeding experiment revealed that the genetic material inserted into GM soy transfers into bacteria living inside our intestines and continues to function." The paper which this statement is based off of actually says "it is highly unlikely that the gene transfer events seen in this study would alter gastrointestinal function or pose a risk to human health" (this topic was reviewed in this post). This is a subtle little white lie, when you contrast it with the downright deceptive (and dangerous) statement that GM insulin poses a health risk (Dr Kevin Folta reviewed this topic here). I still have a tough time understanding why certain organizations would use such deceptive means to attack a technology. I think Dr Neil DeGrasse Tyson said it best in his recent Facebook post on the topic of GMOs: "If your objection to GMOs is the morality of selling non-prerennial seed stocks, then focus on that. If your objection to GMOs is the monopolistic conduct of agribusiness, then focus on that. But to paint the entire concept of GMO with these particular issues is to blind yourself to the underlying truth of what humans have been doing -- and will continue to do -- to nature so that it best serves our survival. That's what all organisms do when they can, or would do, if they could. Those that didn't, have gone extinct extinct. In life, be cautious of how broad is the brush with which you paint the views of those you don't agree with." I was surprised at how many people distrust GMOs because of Monsanto. That's not a good reason for distrusting a technology with broad applications. It's like saying that you don't trust computers because of Microsoft. But conventional food growers buy Monsanto seeds too, and Monsanto doesn't have a monopoly on GM technology. So what do life saving technologies, such as insulin, have to do with Monsanto? What about Golden Rice? What about bananas designed to combat nutritional deficiency in Uganda? I was taken aback at how vehemently these are opposed, just because of the Monsanto-boogie-man. 7) Transgenic seeds are not sterile. I was certain that transgenic seeds could not be replanted, even if a farmer wanted to. I was dead wrong. When farmers buy seeds from a biotech company such as Syngenta, they sign an agreement, and they are not allowed to replant seeds. However, the seed is not sterile or unviable. (The topic of replanting seeds and terminator seeds was covered in my blog post here). 8) Peer review doesn't mean anything these days. Even if you don't factor in the issue of predatory or pay-for-play journals, peer review needs a new paradigm (check out this article for a great expose of predatory journals). In an article that sounds an awful lot like a story about drug trafficking, a "peer-review ring" got recently busted for abusing the academic review process. Although there's a growing number of ways to share concerns or criticisms about a paper, it hasn't led to a change in the review process. There's a whole website dedicated to covering stories about peer reviewed articles getting retracted. Setting aside the reason behind errors in scientific journals, be they deliberate or not, there needs to be a positive feedback loop. Personally, I think that scientists in the private sector should be able to provide feedback to the reviewers and editors about one of their products. They provide press-statements anyway once the paper's been published, so wouldn't it make sense to have their feedback and criticism in hand as a non-voting voice in the review process. Do you know who would read every single sentence several times, including the Supporting Materials section, in a paper that suggests that a GM trait is harmful? The scientist who made it and the company who commercialized it. If anyone is going to identify a flaw in a paper, it will be them. I don't think that their statement should carry weight in the decision of whether or not a paper should be published. But I think it will make the reviewer's job easier to have their observations in hand. "9) That the greatest tool in combating misinformation on scientific topics is for scientists to be better communicators and to better educate the public. I was surprised to see that the link between the public's superstition regarding GMOs is directly related to their education or lack thereof. If we had better scientific literacy or better science education, it would cause less freak-outs. As a non-science person, my AHA!-moment came when I finally understood how eating a strawberry-fish smoothie would be same thing as eating a strawberry with a fish gene in it, because we can process and digest proteins from both species. That's such a small-little thing, but it created such a mental barrier." Well, there you have it. Feel free to comment on the things that have surprised you most on this topic.